Lightweight and easy-to-transport, a high-performance RIBThis RIB (rigid inflatable boat) is easy to handle due to its lightweight, single hull design, delivering rigid hull performance in a lightweight boat that's easy to transport. 1100 Decitex Hypalon/Neoprene fabric is very durable with high-resistance to UV rays for extended lifespan in tropical climates. Truncated tubes carry their flotation aft for accommodating 4-stroke engines, while the transom is mounted further aft for more engine support and interior space. Features double reinforcement in seating/stepping areas, aluminum telescopic paddle, bow carry handle, recessed valve system, port and starboard lifeline handles, 80mm rubstrake, towing rings, three lifting points, bellows pump, repair kit and manual. NMMA Certified. Get rigid hull performance in a compact stowable packageIf you want the performance of a rigid hull, but need a boat that fits into limited storage space, the CR4 is your choice. Combining the performance of a RIB inflatable with the ability to collapse for storage, the CR4 Compact RIB is a unique blend of seaworthiness and portability. 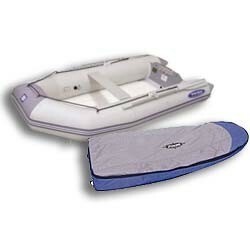 Its fiberglass hull includes a folding transom, allowing this RIB to be easily stowed in its padded storage bag. Large diameter 18" tubes add stability and freeboard for a safer, drier ride, and their truncated ends provide buoyancy to carry 4-stroke outboards. Includes webbing lifelines, two pilot handles, three tow rings, oarlocks and adjustable aluminum oars, inflatable thwart seat, storage bag, foot pump, repair kit and manual. RIB features a heavy-duty fiberglass double hull/floor, plus reliable Hypalon tubes that last even in the hottest climates. 1100 Decitex Hypalon/Neoprene fabric has a high-resistance to UV rays, abrasion, extreme temperatures, gas, oil and chemicals for extended lifespan in the lower latitudes. The double hull has a beefy stringer system sandwiched between the bottom hull and the deck for extra strength and a comfortable deck layout. Truncated tubes add flotation aft for accommodating 4-stroke engines and a transom that is mounted further aft for more support and interior space. Planing strakes offer better steerage through turns and higher performance at speed. Includes flush-mounted valves, double-reinforced seat/stepping areas, bow carry handle, aluminum telescopic paddle, port and starboard lifeline handles, heavy-duty 100mm rubstrake, towing rings, four lifting points, bellows pump, repair kit and manual. Speed, stability and comfort with large-diameter tubes and a great hull design!Looking for a top performing rigid hull sportboat? Our new RIB5s rigid fiberglass Deep V hull handles well in virtually all sea conditions. The boat has been completely redesigned to include larger 18" tube diameter for improved stability and increased freeboard, combined with more internal cockpit space. Improved aft buoyancy from truncated tube ends allows use of heavier 4-stroke outboard engines. Includes webbing strap support and an all-around lifeline, three tow rings, three strong lifting points, foot pump, repair kit and manual.